When the clouds scattered Sunday afternoon, I decided to visit the Kremlin for the first time in about two years with the hopes to catch a nice autumn sunset. I wasn’t disappointed. The gardens and paths in front of the Kremlin were quite busy with people walking to and fro, but there weren’t too many people trying to visit the Kremlin late in the afternoon. I bought my 350 ruble ticket ($8.50) – which allowed me to visit the Kremlin grounds but not the armoury – in less than a minute and waited no more than two to go through the metal detector. I had no problem bringing in my camera, two lens and tripod. 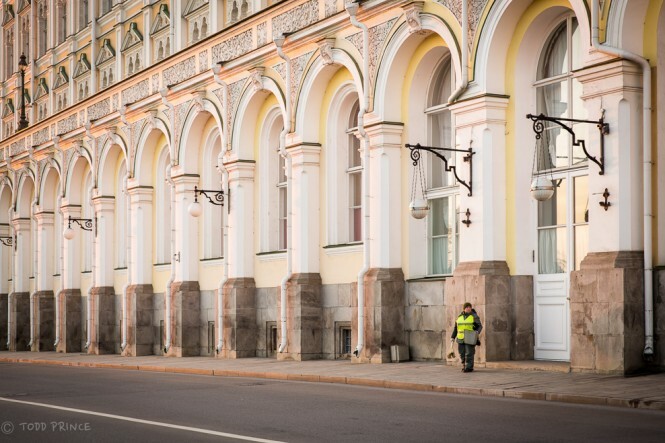 Guards stand in the streets that circle the main sites – Armoury Chamber, Assumption Chamber, Bell Tower and Grand Kremlin Palace – blowing whistles when people step into restricted areas. As I frequently heard the whistle, I suspect visitors often to wander off. 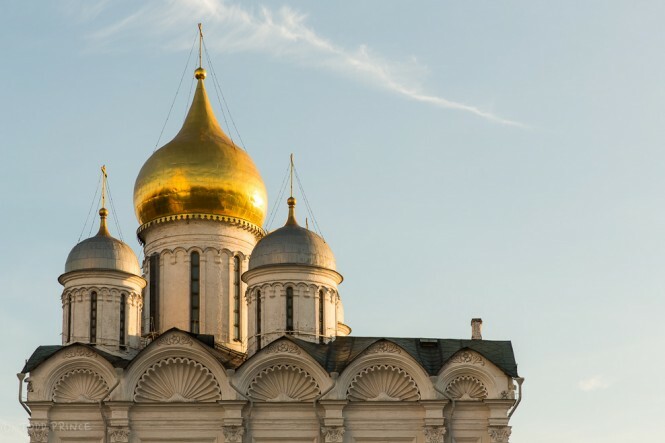 Official cars occasionally pass through the Borovitskaya Tower and enter the Kremlin territory, driving alongside the Grand Palace that oversees the Embankment and Moscow River below. Christ the Savior Church can be seen from that road. 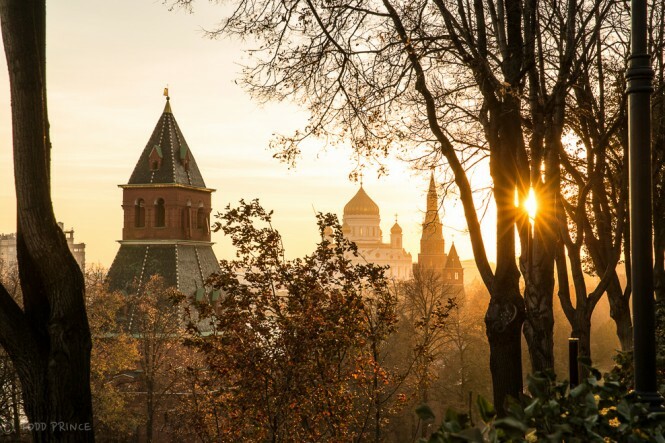 Besides the Kremlin churches – the main attractions – you can find some quiet spots overlooking the embankment with fantastic views of old Moscow…especially at sunset. 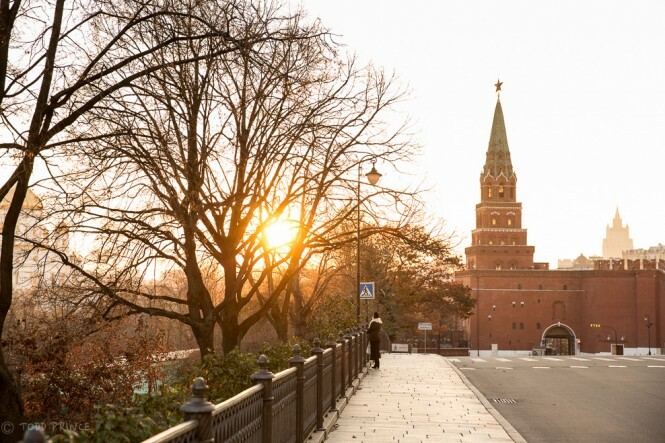 Overall, visiting the Kremlin is a great way to spend a few hours in Moscow, especially on a late, sunny autumn day. 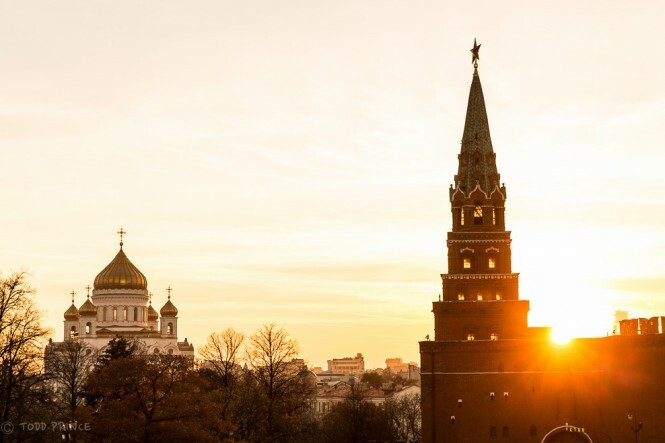 The setting sun peaks through two trees on the Kremlin grounds, sending its rays in all directions. Christ the Savior Church is in the centre with Kremlin towers to its left and right. 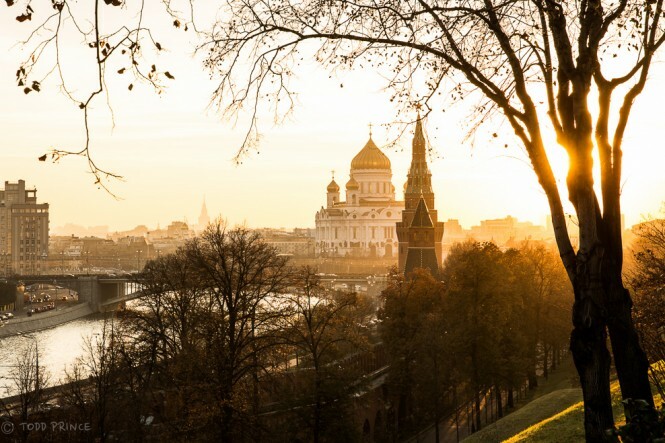 The setting sun is hidden by a tree inside the Kremlin grounds. The Moscow River runs its course to the left, passing Christ the Saviour Church in the centre. 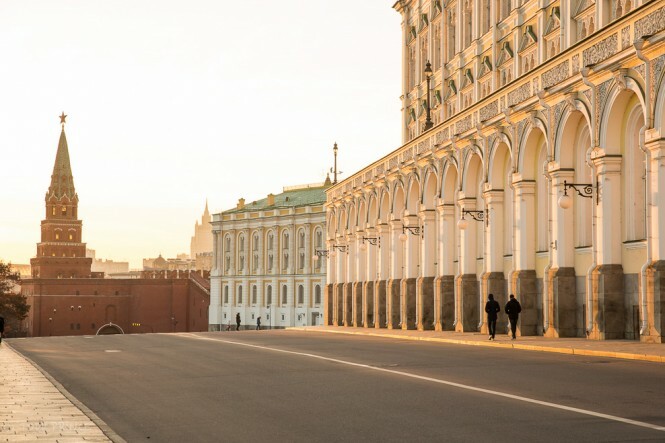 Two visitors passing the Grand Kremlin Palace at sunset time on their way to the exit at Borovitskaya Tower in the distance. A woman gazing out on the Moscow River and old Moscow as the sun sets to her right. 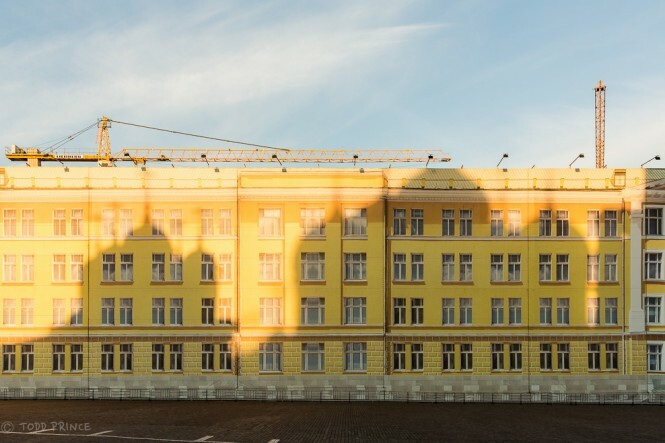 The Kremlin structures are massive, making people look small and insignificant. 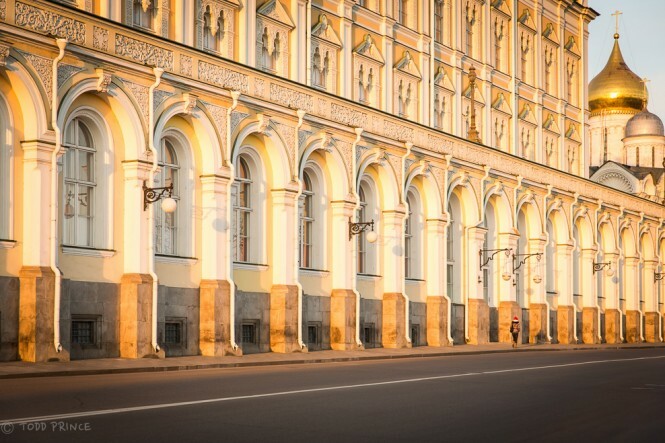 The sun throwing its last rays for the day over the Kremlin wall. Christ the Saviour Church stands to the left. Inside the Kremlin walls, the grounds are pretty spotless and lawns well kept….thanks to people like this worker. 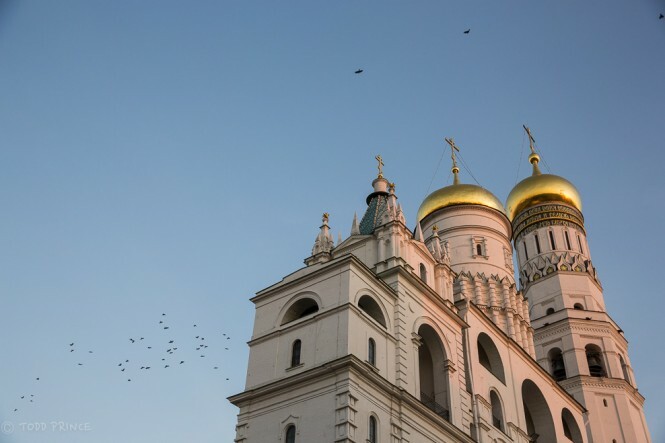 The quintessential photo of birds flying over a church at sunset…in this case, over the Ivan the Gret Bell Tower and Assumption Belfry. 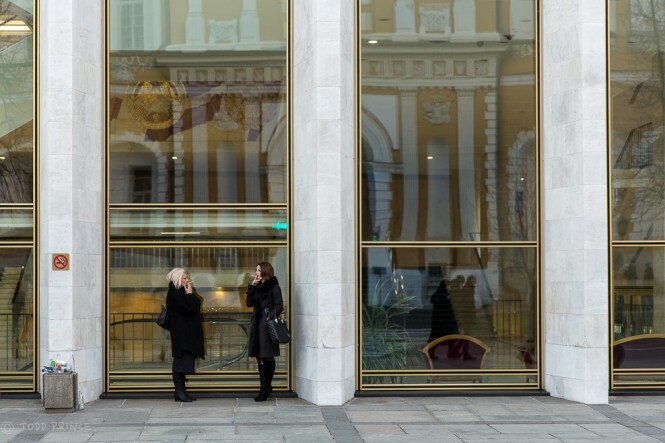 Two women dressed in black and facing each other as they smoke in front of the Kremlin Palace, where concerts are held. Only after I took the photo did I notice the ‘no smoking’ sign to the left. 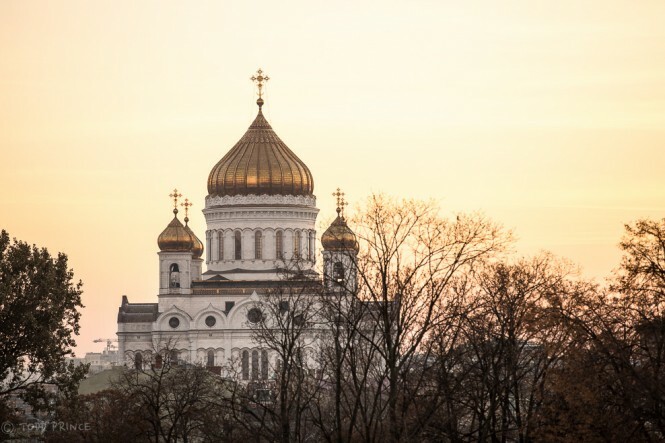 Christ the Savior Church at sunset as seen from ramp exiting the Kremlin. 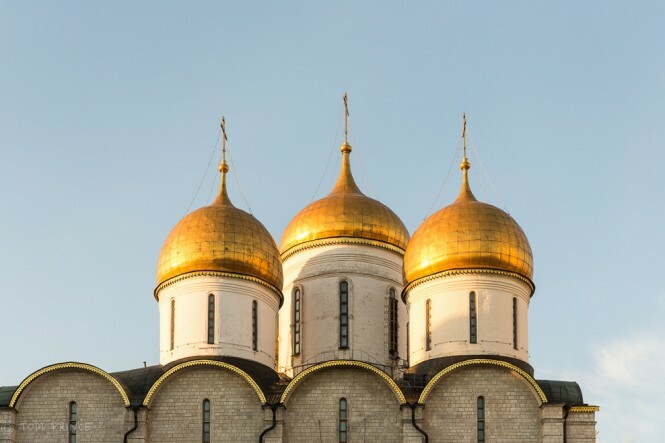 The Cupolas from the Twelve Apostles’ Church and Assumption Cathedral cast shadows on a Kremlin building under maintenance. 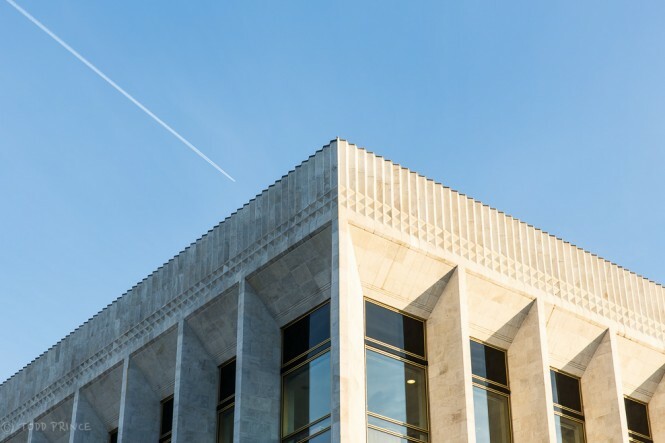 A plane flying over the State Kremlin Palace, where concerts are held. 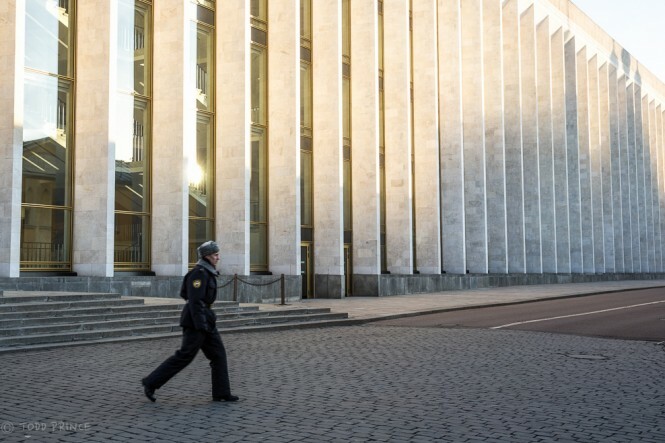 A Kremlin guard running back to his post next to the State Kremlin Palace. 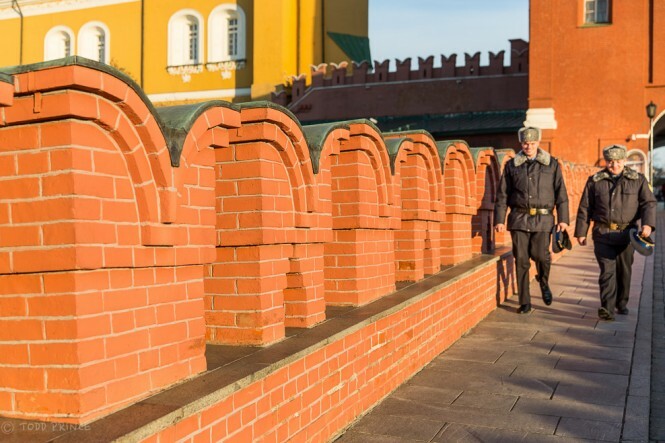 Two officers exiting the Kremlin. 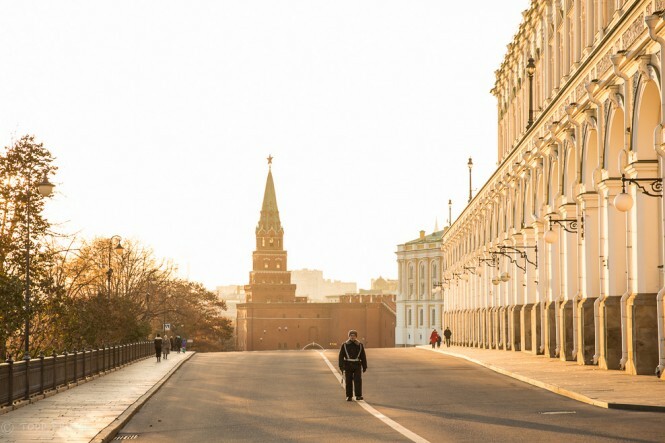 A guard standing on the road that official cars use to enter and exit the Kremlin.